So I dug out some Valentine colors and got to work…what do you think? My birdcage, cute birds & owl stamps are all from the cute set Aviary (pg 121), my hearts on the wire and larger heart stamps are from Valentine Defined featured in the Occasions Mini and my Love sentiment is from XOXO, also in that mini catalog. I love those birds & bird cages and it’s a set I just can’t do without…too cute! Congrats Kendra – please email your mailing address to me and I will get your goodies out to you! TO ORDER YOUR STAMPIN’ UP! SUPPLIES ONLINE CLICK HERE! 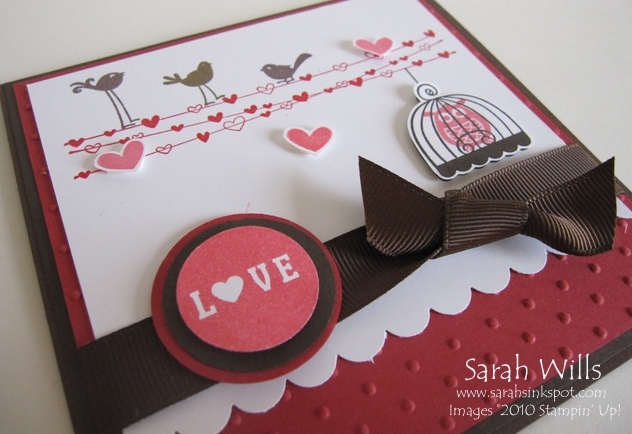 Great Valentine card combining birds and hearts with a little LOVE mixed in for good measure. Like the color combo too! I love how you used the different stamp sets together, very creative! Love this card Sarah! Too Cute!